Tuesday evening, we returned from Lancaster, England, an hour late because there was a broken down train on our line in Lancaster and we had to wait for it to be repaired. We had traveled to Lancaster the day before from Oxford by train, with a change in Birmingham. I had been invited by Professor Graham Rand, very well-known in Operations Research internationally, several months ago to speak in the Management Science Department at Lancaster University. He had become aware that I would be a Visiting Fellow at All Souls College at Oxford University during the Trinity term so he had cordially extended the invitation, which I could not refuse. Lancaster University's Management Science Department is the largest MS department in the United Kingdom with about 45 faculty focusing on Operations Research, Operations Management, and Information Systems. It is housed in the university's School of Management, which is located in proximity to the Lancaster House Hotel, where I overnighted, and which was very comfortable and very convenient. Lancaster University is only about 50 years old and it has an excellent reputation in STEM (Science, Technology, Engineering, and Mathematics) as well as in Management. The School of Management will be getting a new building soon but the existing one I found to be spacious with many windows. The university is close to the beautiful lake region and to the sea and is surrounded by green spaces so the air quality is great there. Given that Oxford University dates to 1231, I found it very interesting to see a relatively new university in England. I had presented Graham with a list of topics that I could speak on and, after canvassing his colleagues, the topic of disaster relief was selected, so my presentation was on Disaster Relief Supply Chains: Network Models, Algorithm, and Case Studies. A nice announcement was prepared for my presentation, which I am very grateful for, and even though the date for my talk was June 28, 2016 and in the US it would be tough to find faculty and students to fill up an audience, I had a great attendance. My full presentation can be downloaded here. After arriving (my husband had accompanied me since he loves train travel), we took a walk around the campus and then it was time to meet Professor Konstantinos Zografos for dinner. Professor Zografos received his PhD from our UMass Amherst neighbor, the University of Connecticut, and I have known him since my days at MIT as a Visiting Scholar and Professor. He was recently inducted into UConn's Distinguished Academy of Engineers with a nice photo of him and other inductees with their medals on the UConn website. Professor Zografos is an academic powerhouse with major contributions to different areas of transportation and the recipient of millions of dollars/pounds in research grants. He has been at Lancaster for about 3 years and has previously been at the University of Miami and also in Greece. He has just been appointed the new Associate Dean of Research at Lancaster's School of Management, a fantastic choice, I must say. We had a great time at dinner, which lasted almost 4 hours and felt like 5 minutes. When we left, we heard that England got eliminated from the Euro 2016 soccer competition, as it got beaten by the lowest ranked team and the underdog, Iceland. It has been a very tough week for Britain with Brexit and now the soccer game loss. 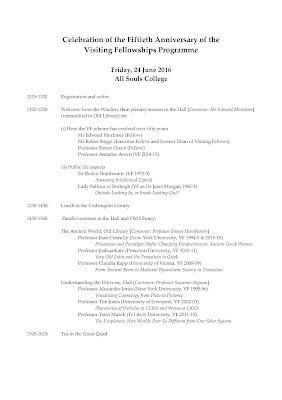 Professor Graham Rand organized a terrific schedule for me. Prior to my seminar at noon, I met with a postdoc and a Visiting Scholar and the postdoc had been interviewed at Oxford University on June 22 (the day of our Encaenia which I had blogged about) and had received an offer for another postdoc at the Environmental Institute there. I had an excellent conversation with him on network vulnerability, one of his research themes. The questions after my talk were interesting and I have had requests for the presentation and so it has been posted. 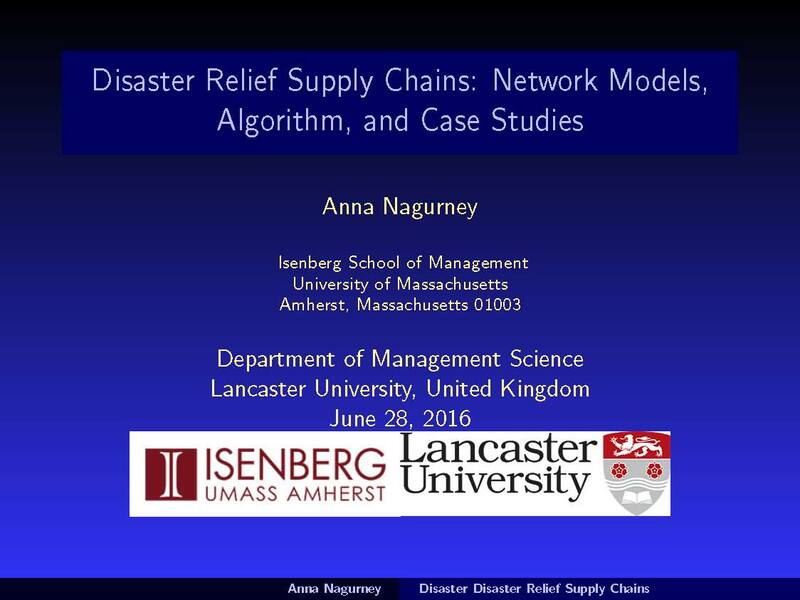 The talk had three parts to it: work on network performance assessment and vulnerability, a mean variance integrated disaster relief optimization model, and our latest work, which is a Generalized Nash Equilibrium model for disaster relief. There are very few game theory models in humanitarian operations so we are very excited about this work. After my talk, it was time for lunch, and joining me were Professor Rand and the Head of the Department, Professor Matthias Ehrgott, who I last saw at a multicriteria decision-making conference that he was involved in organizing in Auckland, New Zealand, and I was an invited speaker. he has been at Lancaster for 3 years. We have many mutual interests in reseaarch so it was wonderful to see him and chat. After the lunch I got to meet with the university's cybersecurity experts since we have been also doing a lot of research in this area and we spoke for over an hour on topics as diverse as the Desmond storm that resulted in a power outage last Fall that closed the university for almost a week to ransomware! While I was busy, my husband had a chance to tour the downtown and to see the castle. Supposedly where the jurors meet is the room where a long time ago people would be hanged. Then it was time to leave and we enjoyed, because of the delay, speaking to others at the Lancaster train station who were affected by the broken down train. Nevertheless, our train eventually arrived and since we had extra time in Birmingham before our connection to Oxford, I marvelled at the Birmingham train station, which resembles an airport! I enjoyed reading the latest edition of the elegant, informative, and glossy IMPACT magazine that Professor Graham Rand gave me. The impact that operations research / management science has had and continues to have in areas of transportation, healthcare, manufacturing, and security is tremendous. So glad to be part of such a wonderful professional community where you find friends and colleagues wherever you may go. I will see Professor Graham Rand next week at the EURO 2016 conference in Poland, where he told me that he will be having breakfast with Professor Mike Trick of Carnegie Mellon University, the new IFORS (International Federation of Operational Research Societies) President and is very much looking forward to it and to the conference, of course. Yesterday was a truly a historic day in Britain. We woke up in Oxford, England to brilliant sunshine and then were shocked with the news that Britain had voted to leave the European Union, so Brexit had become a reality. Living now in a college town - that of Oxford - where intellectual freedom and the movement of ideas and people are essential to research and innovation - the news was shocking and stunning.The repercussions are reverberating around the world. Yesterday was also the day that we celebrated the 50th Anniversary of the Visiting Fellowships Program at All Souls College at Oxford University. I am now a Visiting Fellow (VF) at All Souls College for the Trinity term. I had received an invitation to attend this full day of celebrations while I was in Amherst months ago and was thrilled to take part yesterday and my husband did as well. We began with registration and a welcome by the Warden, Sir John Vickers, who is an economist. Mr. Edward Mortimer, who is a Fellow at All Souls College, provided us with background and the history of the Visiting Fellowship Program, which began in 1966 with the college deciding on November 6, 1965 to admit Visiting Fellows. All Souls College is a unique college at Oxford University in that it does not admit undergraduates. Edward Mortimer, whom I have mentioned in my blog before, worked at the United Nations and wrote speeches for the former Secretary general, Kofi Annan. I was delighted to hear Sir John Vickers say that we were celebrating "one of the best things that has happened to All Souls College." He said that the VF Program provides internationalization of the college and to-date there have been 800 Visiting Fellows from 40 different countries. The first female Visiting Fellow Dr. Janet Morgan, now known as Lady Balfour of Burleigh, was a VF in 1982, while she was also studying the BBC, upon the invitation of the PM, spoke yesterday morning and I was delighted to see her. I also very much enjoyed hearing Sir Roger Braithwaite, who is an expert on negotiating with Russians, and is featured in the photo below. He was UK's ambassador to Russia and also its representative at the embassy in the US where he focused on commercial policy and was very successful. Interestingly, but not surprisingly, the first Visiting Fellows were invited. About 130 Visiting Fellows attended the celebration yesterday. After the morning session we were treated to a delicious lunch in our elegant Codrington Library. Then it was time for tea and coffee before additional panels ands sessions followed by tea and a concert! I enjoyed meeting former VFs from Berkeley and Illinois and was thrilled to see Professor Carol Heim of the Economics department at UMass Amherst, who had been a VF at Oxford a few years ago. 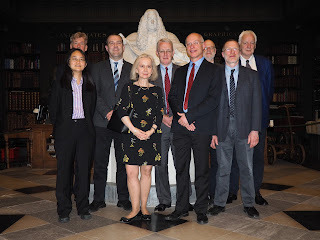 Many thanks to Sir John Vickers and to the Dean of Visiting Fellows, Professor Simon Hornblower, for such a pleasant and very memorable celebration of the the great Visiting Fellowship Program at All Souls College Many thanks also to the staff for the exquisite hospitality, food, and organization. It has been a marvelous experience being a Visiting Fellow at Oxford and the support, intellectual freedom, fellowship with our Fellows, have all been extraordinary. All Souls College is a unique institution and very special. It is an extraordinary experience to be a Visiting Fellow at All Souls College at Oxford University in England this Trinity term. Yesterday, Fellows and many dignitaries were invited to take part and celebrate 9 honorary degree recipients. And what a tremendous list of awardees this is! Below is a photo of the recipients, compliments of Oxford University. I was absolutely thrilled to see the Nobel laureate in Economic Sciences Paul Krugman and also the National Medal of Science recipient Professor Mildred "Millie" Dresselhaus of MIT plus the Spanish filmmaker Pedro Almodovar as well as Sir Jonathan Ive is Chief Design Officer of Apple Inc and designer of the iMac, PowerBook, iBook, iPod, iPhone, iPad, AppleWatch and MacBookat Oxford on the list! The opera singer Jessye Norman was not able to attend this year. The day began with peaches, strawberries, and champagne, and a procession in Radcliffe Square to the Sheldonian where the ceremony took place. After the Encaenia ceremony at the Sheldonian the Quad at All Souls College was the site for drinks before a lavish lunch that took place at the Codrington Library with tea and coffee out in the Quad afterwards. Magically, the skies cleared up so the outdoor events took place on the bright green lawn. I was absolutely thrilled to be able to speak to Professor Millie Dresselhaus and to even meet one of her granddaughters. I had met Professor Millie when I was a Visiting Scholar and Associate Professor at MIT and we would take part in female get-togethers with Professor Lotte Bailyn of the Business School. She told me yesterday how important it is to have technical female professors at business schools and I agree. We also spoke about several of our well-known colleagues in Operations Research at MIT. The lunch was fabulous and the seating arrangement very carefully thought out. The dessert was also wonderful. My husband was seated in front of the former principal of Hertford College at Oxford University, Dr. John Landers . Hertford used to have an exchange program with his university, the University of Hartford, so we took the following photo. Seated across from me was the head of public affairs at Oxford University and next to me an amazing female entrepreneur. the conversations just flowed. I continue to be very impressed by Oxford's website and we talked about the importance of getting news on research out by faculty. After lunch we chatted on the lawn. You can see Pedro Almodovar strolling on the lawn below in red. I had to have a photo taken with Visiting Fellow Richard Vokes, an anthropologist from Australia. I also took the photo of him, my hsusband, and the brilliant nabal historian Nicholas Rodger. And, if you take a look at the photo above, which I took because I very much like my Math Fellows Professors Francis Brown and Constantin Teleman, I also serendipitously snapped Pedro Almodovar on the right in the red gown! Then it was time to walk to Merton College of Oxford University (the university has 38 grand colleges) to attend the Vice Chancellor's garden party. The Vice Chancellor is Dr. Louise Richardson, who was the Executive Dean at the Radcliffe Institute for Advanced Study at Harvard University, when I was a Science Fellow there in 2005-2006. It was great to see her and to shake her hand and to congratulate her on becoming the first female VC in Oxford's 800 year history! The lawns are beautiful at Merton and the spread of food plus orchestra were grand. And, later that evening, the remaining Visiting Fellows got together at a pub for dinner and to finish off a truly special day! The full list of Visiting Fellows during this past year is here. Thank you to All Souls College plus Oxford University for memories that I will always treasure and for friendships made across disciplines! My only disappointment was not being able to personally congratulate Paul Krugman despite trying to find him after the lunch! While a Visiting Fellow at All Souls College during this Trinity term I have been very busy and have been having a fabulous time, making new friends, dining at delicious meals with Fellows, exploring Oxford and its beautiful university, doing research, giving invited talks, and now preparing presentations for the 28th European Conference on Operational Research (Euro 2016) to be held in Poznan, Poland, July 3-6, 2016. Tis will be my first time in Poland and since I am of Ukrainian heritage this conference will be extra special. Technically, one is only supposed to present no more than one paper at this conference but I have been very lucky in that I will be presenting three and a co-author will present another paper of ours. The topics of our presentations are very exciting, I believe, and the talks are almost completed. 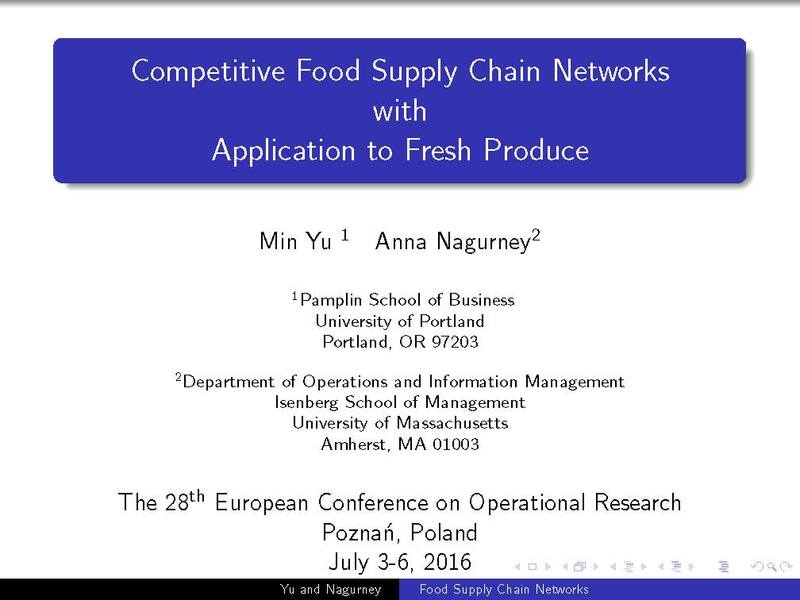 The first paper that I will present is, "Competitive Food Supply Chain Networks with Application to Fresh Produce," which was co-authored with Professor Min Yu, a former doctoral student of mine at the Isenberg School, and a wonderful collaborator. This paper is an invited paper in a special session: Meet the Editors of EJOR. The Editors of the European Journal of Operational Research (EJOR) will discuss the journal and our paper was one of two selected as being impactful and highly cited. The paper can be accessed at: Competitive Food Supply Chain Networks with Application to Fresh Produce, Min Yu and Anna Nagurney, European Journal of Operational Research 224(2): (2013) pp 273-282. I will also discuss how our model is related to several other perishable product (and other) supply chain network models. 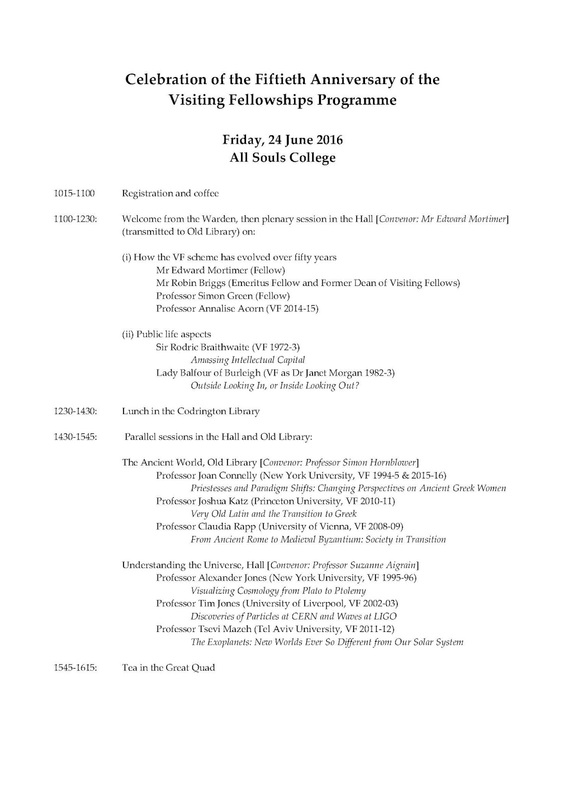 On Tuesday, which is July 4, I was to chair a session and have two papers in parallel sessions! The latter has also happened to me at INFORMS conferences but we will manage, since my collaborator and husband, Professor Ladimer S. Nagurney, will take my place and give the presentation below, while I am speaking on cybersecurity in another session. Our Braess paradox paper will be presented in a Graphs and Networks session. 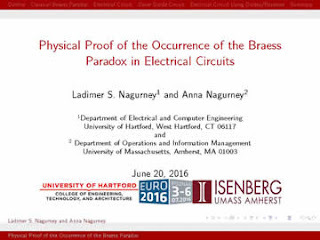 As we state in the abstract for our paper, "Physical Proof of the Occurrence of the Braess Paradox in Electrical Circuits:" While primarily identified with tra ffic networks, the Braess Paradox has also been observed in telecommunications networks and in mechanical spring, fluid flow and nanoscale networks. The purpose of this work is to show that the Braess Paradox can be observed in macroscopic electric networks consisting of resistors and diodes. We first identify the electrical quantities that correspond to the flow and the cost on the network and illustrate the mapping of the cost functions to ideal electrical components. By writing Kirchoff's Law nodal equations for the electrical network, we illustrate how, by appropriate choice of component values, the Braess Paradox can be observed in the network. We show how the classic Braess Paradox examples can be cast into a form where they can be implemented as real electric circuits. 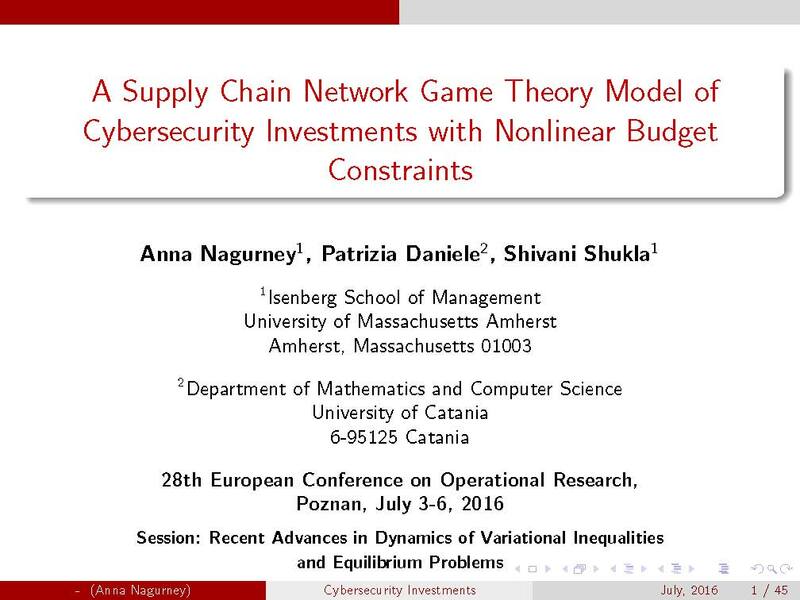 While my husband is speaking on our work on the Braess Paradox, I will be presenting the paper, "A Supply Chain Network Game Theory Model of Cybersecurity Investments with Nonlinear Budget Constraints," co-authored with Professor Patrizia Daniele and my doctoral student, Shivani Shukls. Professor Patrizia Daniele of the University of Catania in Italy organized the session: Recent Advances in Dynamics of Variational Inequalities and Equilibrium Problems 1. She is also a Center Associate of the Virtual Center for Supernetworks at the Isenberg School of Management, that I founded almost 15 years ago! This paper, we are thrilled to announce has been accepted for publication and it can be downloaded from: A Supply Chain Network Game Theory Model of Cybersecurity Investments with Nonlinear Budget Constraints, Anna Nagurney, Patrizia Daniele, and Shivani Shukla, in press in Annals of Operations Research. Professor Daniele also organized the session Recent Advances in Dynamics of Variational Inequalities and Equilibrium Problems 2. Although I was not originally scheduled to present in this session, a speaker cancelled and I was asked by Professor Daniele and the conference organizers whether I could present another paper. Of course, I responded positively. I will be presenting the following paper, which is now in press with Springer in the Dynamics of Disasters volume that I co-edited with Professors Ilias Kotsireas and Panos M. Pardalos. The volume contains 18 rigorously refereed papers and we are very pleased with the volume. 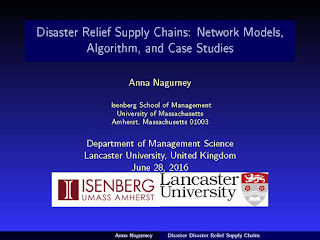 My paper can be accessed at: Freight Service Provision for Disaster Relief: A Competitive Network Model with Computations, Anna Nagurney, to appear in Dynamics of Disasters, I.S. Kotsireas, A. Nagurney, and P.M. Pardalos, Eds., Springer International Publishing Switzerland. Looking forward to seeing many operations research colleagues from around the globe at EURO in Poznan, Poland, soon! This is a truly momentous week and it is fascinating to be living in Oxford, England while history is going to be made. Since late April I have been a Visiting Fellow at All Souls College at Oxford University and I have been writing about the experience. This Thursday, June 23, England will be voting on the referendum on the European Union, that is, whether to Remain or to Leave. The term Brexit, which has been top news not only in England, but also in the United States, refers to Britain exiting the European Union. Many of the discussions at the luncheons that the Fellows attend at All Souls College have been around this issue with the majority of Fellows that I have been speaking with definitely favoring to Remain in the European Union. As someone whose passion is scientific research there are clear advantages to Remain. Researchers and scholars in England can avail themselves of European Union grants and collaborations. I have even served on the Advisory Board of a well-funded European Union grant. With Brexit, it would become much more difficult to secure research funding and to have multicountry research projects funded. Also, the free movement of those in the EU provides for a great vitality and energy and also spurs innovation and fresh ideas. Lately, frankly, as I check out both CNN.com and BBC.com these websites' top stories tend to be identical so that I sometimes wonder whether I am in the US or in England. Now our hearts are breaking because of the horrific murder of Jo Cox, the MP (Member of Parliament) in broad daylight.as she was going about her work. The mother of two small children, ages 3 and 5, who had been elected in may 2015, she had worked as the policy chief in Oxfam in Oxford and her husband works for Save the Children. To have a mentally ill individual kill such a shining light has created a pall over all of us. Her husband' tribute was incredibly touching and now every time that I walk along the Thames I will think of her since she lived with her family on the river in a house boat. She was for Remain. Even my neighbor from Amherst sent me an email yesterday expressing her shock and horror at this terrible tragedy. 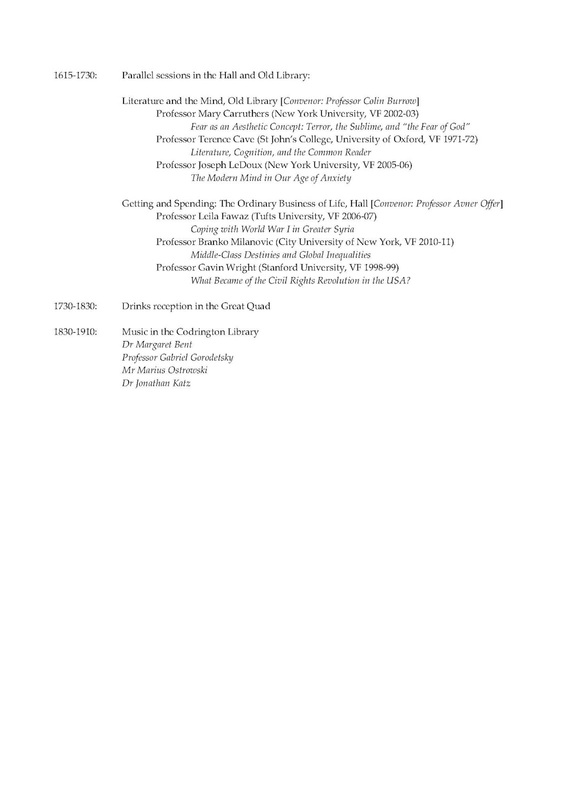 On Wednesday, we will be taking part in honorary degree celebrations at Oxford University, where 10 will be honored, including the Nobel laureate in Economic Sciences, Paul Krugman, whose Opeds in The New York Times on the potential impacts of a Brexit I have been reading, as well as Professor Millie Dresselhaus of MIT, whom I had met when I was a Visiting Scholar and Visiting Professor there. It is a tradition for All Souls College to host the luncheon after the ceremony, and I received the nice invitation below for it. I would have also marched but I did not bring my Brown University cap and gown with me since I already had a lot to carry for more than two months in England. 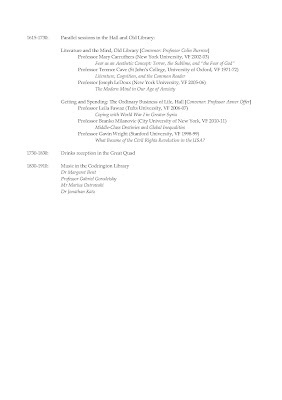 The full day program next Friday is splendid and is featured below and I hope to share photos with you of both the honorary degree recipients and the Visiting Fellows program later in the week. Women were admitted as Fellows at All Souls College only in 1979.